RAMCO has built many unique multistage systems. This customer required a cleaning system for light weight deep parts processed in a fixture. The system had to clean inorganic and organic soils. Acceptable cleaning chemicals had to be used in accordance with stringent specifications. A four stage processing system was developed at RAMCO involving agitation/turbo/filtration for washing followed by dual cascading immersion rinses using DI water. The last stage was a hot air knife dryer. The heart of each system is the adroit use of the elevator within each processing chamber. The elevator is used to transport components into and out of each chamber. However, its most important function is to position and move the components within the working zone. 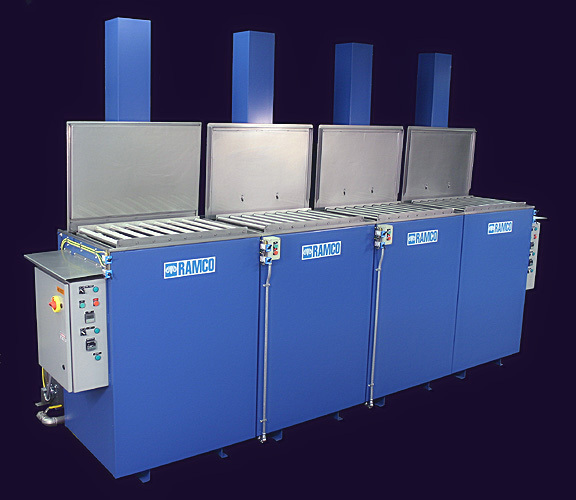 It is this aspect of its function that allows RAMCO systems to achieve superior results in washing, rinsing and drying. We call this Dynamic Flow Combination. The effect of Dynamic Flow Combination is better coverage of component surfaces, more consistent results and accelerated processing times. In this case the elevator was used to provide platform agitation used with turbo (spray under immersion) washing. 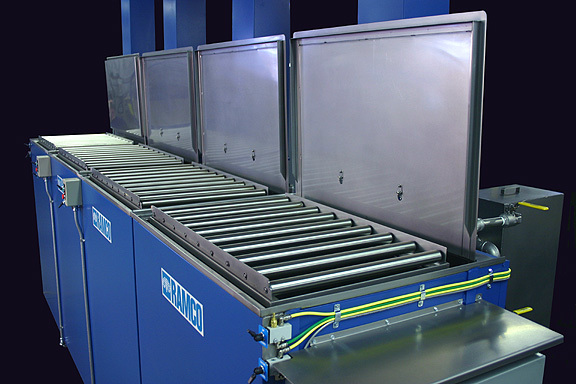 Roller conveyor sections were provided on each elevator platform to allow easy lateral transfer between stations without having to fixtures.